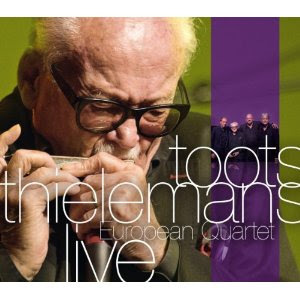 Everybody knows that Toots Thielemans IS jazz harmonica. He is the man. He phrases like a horn. Others have followed in his wake but he continues to lead the way. If you listen to the late George Shearing’s Quintet in the early 50s, when Toots was the guitarist, you can hear in the few features for the Thielemans harmonica that he had gotten his style pretty much together by then. And he’s kept going for the many years that have followed, refining and perfecting his technique but pretty much working out the game plan established in those days. He is a bop and after cat, with a lyrical side that pronounces with eloquence. The CD European Quartet Live (Challenge Jazz 70160) gives you plenty of undiluted Toots in later years, as vital as ever. The European Quartet benefits from a long tenure working together. It’s Toots with Karel Boehlee (piano, synth), Hein Van de Geyn (acoustic bass), and Hans Van Oosterhout (drums). They’re a first-rate jazz outfit. Mr. Boehlee’s piano shows a nice touch, lush harmonies and a lyricism that complements Toot’s way of going about it. The music was recorded at various venues between 2006-2008 and it catches the group in good form. There are some exquisite renditions of standards like “I Loves You Porgy,” “The Days of Wine and Roses,” and the “Theme from Midnight Cowboy,” plus some more directly jazz-oriented numbers. They swing along or get into ballad mode as needed. It’s a good one. If you don’t have any Toots this would bear up nicely in your collection. Definitely pure Toots.